BAZER Triple Shaft Horizontal Vibrating Screens are designed and manufactured to satisfy the extreme operating duties found in different applications. Our Horizontal Vibrating Screen includes double and triple deck configurations ranging from 1500 x 5000 mm to 1800 x 6000 mm. All units are built to meet the needs of today's demanding producers. The units utilize fully contained oil lubrication system. The vibrating mechanism comprises of timed shaft and gears rotating within large, oversize spherical bearings. The BAZER range of Horizontal Vibrating Screens find Application in Aggregate & construction industries, Iron ore mines & plants, mining & mineral industries and Sponge iron plants. Triple shaft arrangement generates elliptical throw that can be adjusted for changing stroke angle and stroke length by clocking the gears. High stroke of 19 mm that compares to inclined screens. High capacity, more than 1.5 times of equivalent size inclined screen. the proven BAZER range of Horizontal Screen increases production reduces recirculation load and adds profit to your daily operation. the triple-shaft-impulse-mechanism located in the center of the screen box create a unique elliptical throw. This elliptical throw makes the screen virtually non-plugging and improves screening efficiency. the ability to change angle of throw, amplitude of throw and speed of screen allows the screen to be fine-tuned to maximize production for almost all conditions. the bearing mounting method provides long service life because loading is distributed over a large area. The extra-strong box construction and heavy-duty spring mounts add up to make a screen which will yield maximum performance under tough conditions year after year with minimum downtime. The screen is equipped with an adjustable pitch drive sheave that allows for a different range of operating speeds. Changing of screen's speed is achieved by adding or removing a series of spacers in the drive sheave. BHP is proud to introduce its BAZER range rang of Horizontal Vibrating Screens, packed with a host of features that make it reliable, robust and easily adjusted to a variety of tough applications in the aggregate, mining, cement and steel industries. 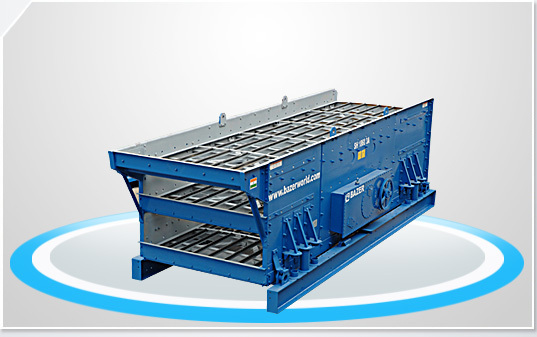 Our Horizontal Vibrating Screen includes double and triple deck configurations ranging from 1500 x 5000 mm to 1800 x 6000 mm. All units are built to meet the needs of today's demanding producers. The units utilize fully contained oil lubrication system. The vibrating mechanism is comprised of timed shaft and gears rotating within large, oversize spherical bearings. The screen ship complete with sub-frames, motor mounts, v-belt drive guard, springs, and lined cross members. The result is a line of screening products that will complete in performance and durability with any comparable products available in the market. High stroke of 19 mm that compared to inclined screens. High capacity, more than 1.5 times equivalent size inclined screen. More efficient screening due to slower travel rate of material. The proven BAZER range of Horizontal Screen increases production, reduces recirculation load and adds profit to your daily operation. The triple shaft impulse mechanism located in the center of the screen box create a unique elliptical throw. This elliptical throw makes the screen virtually non-plugging and improves screening efficiency. The ability to change angle of throw, amplitude of throw and speed of screen allows the screen to be fine-tuned to maximize production for almost all condition. The extra-strong box construction, heavy-duty spring mounts add up to make a screen which will yield maximum performance under tough conditions year after year with minimum down time. The screen is equipped with an adjustable pitch drive sheave that allows for a different range of operating speeds. Changing in screen's speed is achieved by adding or removing a series of spacers in the drive sheave.